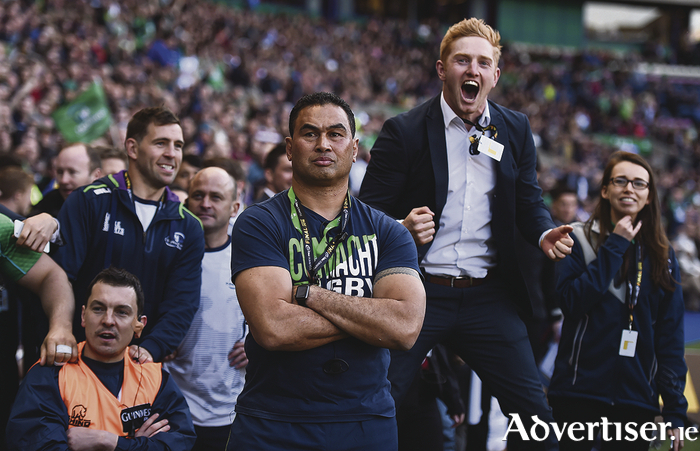 Calm and composed to the end: Connacht head coach Pat Lam watches the closing stages of the Pro 12 final as other backroom staff and squad players get ready to celebrate the historic win. Photo: Sportsfile. It is a triumph that has produced the biggest shock wave in rugby this season. Connacht, never higher than seventh in the Guinness Pro 12 League, found the right ingredients to cook up a storm this season. And now, they can not only dine with the big boys next season in the Champions Cup, but they can sit at the top table alongside the French and English champions as top seeds. It is certainly a dream come true for Connacht Rugby, its supporters, and all those who have fought throughout the years, holding the province together in often the harshest of environments, in the belief this day would come. The biggest rugby underdogs to have secured the Pro 12 title in its 14 year history, Connacht continued all season trying to perfect their recipe for success. Combining the basic ingredients of hard work, belief and teamwork, with large dollops of structure and skill, the have created an expansive game that is exciting, entertaining, and ultimately successful. Saturday's performance was the creme de la creme, produced in the style with which followers of Pat Lam's team have become accustomed. Understandably long-serving captain John Muldoon was "lost for words"; Pat Lam describing the win as " a wonderful day " for everyone in Sligo, Leitrim, Roscommon, Mayo and Galway. "We spoke all week about wanting to go out there and do what we have done all year. I think we did that, and that is the most pleasing aspect of it. The fact that we didn't go into our shells - probably a little at the start of the second half - it's phenomenal, delighted for everybody," says Muldoon. The 34-years-old Portumna captain, who produced a Man of the Match performance, has always maintained his faith despite some dark days in the province- including the now famous march on IRFU headquarters to stop plans for it to be dissolved. "Always believe. You dream, and you lift that trophy over your head every single day. Out in the back yard, and I have two brothers, we fought and we laughed, and every day, I might have been lifting the Liam McCarthy Cup, which is a little bit different when I was a kid. But nothing changes. You always believe, but when you are going through tough days, it is always harder to believe. "I have said it lots of times - I have walked in off the pitch and said that's me done, I'm not staying. At times we were not moving as quick as I wanted us to move, or I felt I needed a place to move, but it's where you are from, it's who you are, it's friends, family, neighbours - and a lot of them are not rugby people - it's huge. "I'd be lying at times that I didn't see this coming, but ultimately deep down, you always believe it is coming, believe that you can be part of it, and I'm just chuffed that I am here." Muldoon described the dressing room afterwards as "euphoric", and also a little emotional. "I got emotional a couple of times and thought I was done, and then Eric [Elwood] comes in and sets me off again. I have said it in the last few weeks, there are a lot of people who have put more into it than I have and a lot people supporting Connacht Rugby long before me, they will all be proud tonight, and enjoy this as much as we will. "We all watch sport because on any given day, anybody can win, that is the beauty of sport. Sport can be beautiful, but it can also be be very cruel. At the back of our minds today we knew we'd had a great year, but this could have been cruel in the way we finished. "Thankfully, as we said all week, we wanted to go out playing as we have been playing. That was the big thing we have been hammering, Pat's been hammering it, I have been hammering it, "don't fall back into habits of old". "Probably some people in the crowd and up in the stand were thinking about Grenoble. We went up 15 points against them and today we didn't panic, we have learned lessons. "From our point of view, we have a game plan, and no matter what people say, we still stick to it wholeheartedly, and I think you have to credit the lads for that, because I don't think everyone would do that." Muldoon says it has taken Lam and his management team some time to do it, but the squad had brought into it wholeheartedly, and was seeing the fruits today. "All year and to a lesser extend last year, it takes a lot of balls to do that. We have been in the Sportsground where people have been shouting 'kick it, kick it, kick it', and we just do what we do, and it's won us the championship."